1 March 2018 The MPF is now within the Steyning Conservation Area, despite SPC Chair Cllr Northam and also Cllr Muggridge actively opposing this with letters of objection to HDC even after SPC had resolved to support its inclusion. 26 September 2017 - MPF to be included in the Conservation Area? Thanks to strong pressure, Steyning Parish Council, uniquely, agreed to accept representations from the public at its working party meeting last Tuesday evening. Despite opposition from several councillors led by Cllr Muggridge, the working party has recommended that SPC should make representations to HDC in support of the MPF and the Rublees hedge being included in the extended conservation area. The working party also recommended that SPC should not oppose HDC's recognition of the importance of the landscape fringes to the town - MPF, Abbey Road Village Green, and Bayards Fields. The same councillors were opposed to Bayards Fields being recognised despite their importance in forming the beautiful and important green backdrop to our High Street. This is a great achievement thanks to public lobbying but currently remains subject to ratification by SPC's Planning Committee on Monday. September 2017. HDC's Conservation Area Review Consultation lasts until 3rd October 2017 - MPF likely to be included within an extended Steyning Conservation Area. This will give the MPF extra protection to enhance its existing village green status as there will be less scope for permitted development construction work, any development will need to take account of the conservation area planning guidelines, and most work on trees will need to be approved by the HDC arboricultural officer. If you agree with us, please send your comments/email of support to strategic.planning@horsham.gov.uk by 3 October. This must include your name and address. Please make plain that you are writing about the Steyning document as several areas are under review. June 2016 A second village green for Steyning! We are proud to report that on 7th June 2016 WSCC agreed to our application for four and a half acres at Abbey Road Open Space to be registered as the latest English village green, adding to a centuries-old tradition of protecting open space for the recreational use of local residents. On 25 July 2014 Steyning Parish Council had erected notices around the Abbey Road Open Space purporting to make the public’s use of this land subject to permission from the Council. This was an “act of challenge” by the Parish Council intended to prevent the land being registered as a village green. If this action by the Council had been allowed to stand then at a future date this permission could have been withdrawn, leaving Steyning Parish Council free to restrict or prohibit the public’s use of this precious open space. More on the Open Spaces Society’s website - click here Please consider sending them a donation as a mark of gratitude. 13 March 2016 Mr Kelly gives the game away. 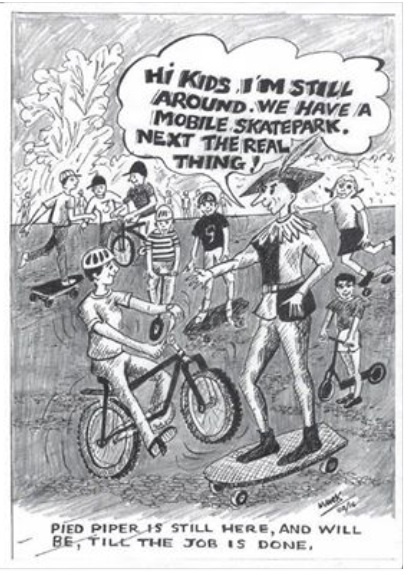 In case anyone was in any doubt that the mobile skatepark the Council has agreed to host on the MPF is a stalking horse for a permanent concrete one, Mr Kelly - one of the main promotors - has confirmed this with another of his "cartoons"
13 March 2016. Please Read and Draw Your Own Conclusion About Cllr Toomey. Here is the text of an email sent to Cllr Toomey by our chairman on 28th February 2016. There has been no response. As you know, I was part of the architectural team for the Steyning Centre. As a result, I well-remember your concern to protect the amenity of local residents with particular emphasis on the potential effects of noise disturbance. Of course you were, and are, one of those local residents. Because of your input a sophisticated public address system was necessary at significant extra cost. The sound system cuts out at a pre-determined noise level and also when doors or windows are opened during an amplified music session.The hours of operation are also restricted. The inconsistency between the measures you required to protect your own amenity from the potential effects of noise disturbance and your apparent lack of concern for the amenity of residents affected by your desire to build a skatepark on the MPF is inexplicable unless you simply have not appreciated the nature of the problem. This does seem entirely possible as you have stated publicly that you do not read our emails. I hope you will make an exception for this message. At the last meeting of SPC you dismissed the concerns of those of us who will be affected by the noise of the skate park. You said something to the effect that most people do not think there will he a problem except after dark. But that is not the position at all. The two firms of expert noise engineers who have great experience with skateparks, the first instructed by SPC itself, both think there will be a significant problem. The HDC environmental health officer thinks so too. And this is just on the question of actionable noise nuisance, the erosion of a place of tranquillity occurs at a much lower level of disturbance. Those of us who live nearby and those who use the MPF outside the times when organised sports are being played all recognise the degree of tranquillity which generally prevails. There is currently a harmonious balance between all users of the Field with short periods of noise such as when the cricket club is in use for social events (far closer to residents and with none of the noise mitigation measures you enjoy), cricket nets in use very close to gardens, football matches etc. All with no complaints from local residents. This is because any disturbance is short- lived, just as any disturbance for you at the Steyning Centre would have been short -lived. In stark contrast, the skate park would be in use throughout daylight hours every single day of the year, weather permitting. With impact noises from skateparks being widely recognised as being particularly irritating. Imagine your neighbour tapping even gently on your wall throughout the day every day. Chinese water torture works in the same insidious way. The point is that noise disturbance is not an absolute measure. Noise generated in an already noisy area is much less likely to be a problem than the same level of noise generated at a quiet location. The bands who perform perfectly happily in our high street pubs, including my family’s, could not perform at The Steyning Centre for example. Similarly the Shoreham skate park next to a busy road is fine but would not be at the MPF. The FoMPF did offer to arrange for parish councillors a private presentation and discussion session with Alan Saunders (Sound Engineer) to help explain the nature of the problem. Perhaps you would want to reconsider the rejection of that offer, though I hope the points I have made in this message will help you see things differently without the need for that. I would be grateful for your acknowledgment that you have read this, please. Even better if you confirmed that these points have brought about a change of mind. 13 February 2016 SPC Misinformation about effect of MPF village green status. It suits the agenda of those parish councillors who still wish to build a skatepark on the MPF to portray the village green registration as a problem for the whole community. Chief among these is Councillor Toomey, but strongly supported by Councillors Muggridge and Northam. All three are past or present members of the SWAB Neighbourhood Plan steering committee which “coincidentally” has just decided that the MPF does not qualify for “Local Green Space” protective designation under our neighbourhood plan which they have been preparing in conditions of almost total secrecy. In furtherance of portraying the village green registration as a problem the Council has claimed, completely incorrectly, that it is legally required to refuse permission for anyone other than local residents to enjoy any activity on the MPF. We have repeatedly explained the true position (for more see our posting of 17 November 2015), but even after using the Council’s uniquely byzantine complaints procedure it refuses to accept that it has been giving out incorrect information. Please click here for an illuminating illustration of the Council’s mind-set and how it has side-stepped its own complaints procedure. The correct synopsis of the legal position regarding village greens is that "While the benefit of village green status accrues to local residents this certainly does not make them the only people who can use the MPF. The Council, as owners of the land, can either give tacit permission (by doing nothing – as happens every time a visiting team plays, every time a spectator comes from outside the area, every time a dog walker from outside the area uses the MPF) or it can give express permission as sought by the charity group. The only inhibition on the Council’s ability to give permission is that the use by the non-resident(s) should not adversely affect the enjoyment rights of the local residents who have the benefit of the VG status." The proviso in the final sentence, incidentally, being one of the many factors which the Council is going to have to take into account very carefully if it decides to pursue its ambition for a permanent skatepark on the MPF. It is clear that a permanent skatepark, far from enhancing the enjoyment of the green as the law requires, will adversely affect the enjoyment of the vast majority of local inhabitants and so make the Council liable to prosecution. 11 January 2016 SPC Loses Secrecy Legal Battle over its False "Extraordinary Allegation"
After an eighteen month legal battle, West Sussex County Council and Steyning Parish Council have lost in their attempt to keep secret from the public an exchange of correspondence about the registration of the Steyning Memorial Playing Field Village Green. The Information Rights Tribunal has directed disclosure of their correspondence.. It turns out that while the Parish Council’s apologists, including Mr Alexander (husband of then Parish Councillor Mariella Alexander), were putting on Facebook allegations of criminal wrongdoing concerning the speed of the MPF village green registration, the Parish Council itself was making exactly the same baseless allegation to West Sussex County Council which undertook the registration. The senior legal officer at the County Council refuted this with a robust reply describing the Parish Council’s allegation as “somewhat extraordinary” and demanded it spell out what crime was being alleged and who the alleged perpetrator was. Shortly afterwards the Parish Council backed off, seemingly satisfied that the registration process was completely proper. Despite the Parish Council knowing what had been put on Facebook it has done absolutely nothing to put the record straight but instead has continued to assert that the registration was "irregular" and has worked with WSCC in trying to prevent the public from knowing the truth about its correspondence with WSCC. Was the Parish Council itself the source of the information leading to the same allegation on Facebook by its supporters? Is that why it did not want the public to see what it had written to WSCC? The correspondence also reveals the parish council’s hypocrisy. While complaining bitterly when judicial review and the Freedom of Information Act were used against it, the Parish Council called in aid exactly the same procedures against the County Council. Perhaps unsurprisingly in view of the double standards this reveals, the Parish Council resolved to do so at a meeting from which the press and the public were excluded. Using the Freedom of Information Act we eventually also obtained the minutes of this meeting which took place on 8 July 2014, however the names of the councillors who proposed and seconded this course of action have been blanked out. Unusually, the voting details are not given either – just “by a majority”. It seems the councillors involved are rightly embarrassed by their actions. And the minutes of the confidential part of the 8 July 2014 meeting can be viewed here, though they are still not included in the Parish Council's published minutes which normal practice requires. It is the discussion whch is supposed to be kept confidential; not the decision. 17 November 2015 MPF Skatepark Back on the Agenda. Just when we began to hope that the horrible divisions in our community caused by the MPF skatepark controversy were healing, the skatepark has been put back on the agenda, with Cllr Toomey urging the Council to revisit its decision not to try to remove the village green status which protects the MPF. Mr Kelly, one of the chief proponents of the scheme, has now confirmed in an open letter what we all suspected. That the withdrawal of the planning application was merely tactical. The issue has now been raised twice by Cllr Toomey since the elections in May. You can hear the anger in his voice at this recording of the meeting on 9 November 2015 when he wrongly claimed that the MPF village green status means it can only be used by local residents. Cllr Toomey's contribution starts at 51 minutes into the recording and ends ten minutes later. “…At 51.36 Cllr Toomey then misquoted Cllr Ness-Collins when he said that she had told us that the group could not use the MPF “for the reason that we cannot have non-residents using our playing field”. It is vitally important that anyone making decisions regarding the use of the MPF should know that not only did Cllr Ness –Collins not say this, but also that this would NOT be a reason to prevent anyone using the MPF. While the benefit of village green status accrues to local residents this absolutely does not make them the only people who can use the MPF. The Council, as owners of the land, can either give tacit permission (by doing nothing – as happens every time a visiting team plays, every time a spectator comes from outside the area, every time a dog walker from outside the area uses the MPF) or it can give express permission as sought by the charity group. The only inhibition on the Council’s ability to give permission is that the use by the non-resident(s) should not adversely affect the enjoyment rights of the local residents who have the benefit of the VG status. Cllr Toomey went on to make other incorrect statements including that “use as a playing field is hampered” by the VG status. The opposite is the case. The status means that the MPF can be used as a playing field in perpetuity. What the status prevents is building on the field”. And as you are so may you ever be. 18 January 2015 - “SKATEBOARDING in Steyning is in the hands of residents, say councillors, who have slammed a school for abandoning the community that created it.” – SPC 2012 - Has anything changed? We have had many messages of congratulation and expressions of cautious optimism. In contrast, one major supporter of the MPF skatepark who posts anonymously (and thus reprehensibly many may think) immediately pronounced that :- “….Supporters of the MPF Skatepark, the Parish Council and the school will not be bullied into taking the morally reprehensible stance of forcing the school into submission to the detriment and safety of pupils and our youngsters in general……THERE WILL BE NO SKATEPARK AT THE LEISURE CENTRE”. See the full post at the Facebook site. As we have said throughout – no one intends to “bully” anyone. The planning consent is merely an enabling first step which can go further only if the School is willing to discuss matters. So far it has refused to meet or discuss anything and perhaps for that reason many of its planning objections, not one of which was upheld by the planning inspector, seem to have been based on misunderstandings as to what is intended. It is perhaps worth reminding everyone of what Steyning Parish Councillors said about the School’s attitude to the community of which it is part in 2012 and the commitment then by Cllr Sue Rogers to continue to try to make headway with the School. Perhaps this would be a good time for all to try again. Cllr David Barling “added he and Horsham district councillors, Sue Rogers and George Cockman, and West Sussex county councillor, Derek Deedman, had written to Steyning Grammar School’s governors, asking for the possibility of the park being placed on school land to be looked at, but a request for a meeting had been flatly refused. Mr Barling said he and colleagues had been disappointed with the response they had received from governors. “I have had a letter unfortunately saying they were not prepared to change their views on this, and they were not prepared to meet with us. “I am very disappointed that we have had such a response,” he said, adding the school felt it did not have enough land to house the facility. Mrs Rogers agreed the reply had been disappointing, but said the door had been left “ever so slightly open”, and that she hoped to take governors up on the invitation of a tour of the school grounds. “We will continue to try,” she added. It is noteworthy that the School’s reasoning in 2012 which it still hangs onto is that it does not have enough land to host the facility. As Michael says in his report, the area of land concerned he has worked out is a completely insignificant 0.05% (one twentieth of one percent). It is not a question of “bullying” the School, but of hopefully persuading it into discussions whose outcome could be for the benefit of the whole community of which the School should be such an important part. The School has so far shunned the Parish Council, the two district councillors (Sue Rogers and George Cockman), as well as the current and previous county councillors (David Barling and Derek Deedman) all of whom democratically represent the community. It has also shunned the Chief Executive of Horsham District Council, Tom Crowley. And all this despite the School's governors coming from within the same community. Now that SPC has withdrawn the MPF proposal and the Leisure Centre site has planning consent is it not time for a re-think by the governors and for our councillors to try to facilitate this in accordance with Sue Rogers’ 2012 statement that they would “continue to try”? 12 January 2015 - Planning Permission Granted at the Leisure Centre We are delighted to report that The Planning Inspectorate has overturned the decision of Horsham Council's Planning Committee (South) and has granted full planning permission for a skatepark at the Leisure Centre. In reaching his decision the Inspector found that all the concerns voiced by objectors are unfounded. Click here to see the decision. After eluding Steyning for a generation there is now the opportunity for our whole community to work together to provide a skatepark in the area of the Town originally preferred by skaters themselves. It is also just over the road from the location the residents of Steyning expressed their overwhelming preference for in the Parish Council’s 2011 Town survey. 17 December 2014 - Leisure Centre Planning Appeal Please click here for our comments which the Planning Inspector asked us for. WARNING - It's quite long so pour yourself a drink first! And try to keep your blood pressure down when you read about the HDC machinations. 3 December - Parish Council Leaflet Describes its Decision re the Village Green Status for the MPF. Please click here to see SPC's leaflet which all residents should have received and which tells us that twelve of our fifteen councillors voted behind closed doors by an unknown majority not to attack the village green status of the MPF. So three councillors apparently did not feel this momentous decision was important enough even to attend. SPC does not want the press or the public to know. Was the vote unanimous or by a majority, and if by a majority what was the number of dissenters/abstainers? We accept that there is an argument for holding the meeting in the absence of the press and public – though we note that an excellent debate by councillors took place in public on 10th November when discussing the possible Abbey Road land swap and all the same arguments for confidentiality would apply to that. What there can be no valid case for in a democracy is for the minuted SPC decision of 19th November not to be published. Which is exactly what the Council has refused to do. Click here to see our request for the minutes to be published and to see the Council's refusal. So the decision of 19th November is described in a press release (the text of which has not been put on SPC's website) and then described in a leaflet delivered door to door (but not put on the SPC website) but the minutes which would reveal which councillors were present and by what majority the decision was made is to be kept a secret from those whom the councillors represent. Can anyone in the Town offer any sort of justification for this in a democracy? And why nothing on SPC's website? Could it be that the Council wishes to avoid the semi-permanence of such a record while hoping that the leaflet is quickly put in the recycling and then forgotten? "Openness and transparency are crucial pillars in local democracy and must be upheld. It is time for state officials to stop hiding behind out of touch excuses.....Blinkered actions like this completely undermine the good work that councils do to champion local communities and local interests". Little did the Minister think that the new Regulations would be evaded by the simple expedient of SPC holding no fewer than three meetings in quick succession from which the press and the public have been excluded, and the Minutes of the decisions then kept under lock and key. So much for "openness and transparency " in Steyning. This inappropriately secretive conduct by SPC does exactly what the minister says – it undermines the undoubted good work the Council does for us. 28th November - Planning Inspectorate Appeal re Skatepark at Leisure Centre. With a skatepark seemingly now not possible on the MPF because of its Village Green status, and also because of its unacceptable noise profile at that location, and because of its remoteness from supervision there, the only realistic site for a skatepark appears to be next to the Leisure Centre, which is where the youth group originally said they wanted it in the first place. We remain keen to work with all interested parties in making this possible. Our appeal against the HDC refusal of planning permission at the Leisure Centre is pending and we have just heard from the Planning Inspectorate that our time for responding to further submissions from interested parties has been extended. This extension of time gives a brief opportunity for opponents of this planning application to reconsider. Once again we urge all those who wrote to HDC objecting, including Steyning Parish Council itself, to consider writing again withdrawing their objection and preferably supporting this scheme. With SPC's decision not to seek to remove Village Green status from the MPF the Leisure Centre seems to be the only realistic option unless the Neighbourhood Plan is able to come up with a long-term strategic alternative. The current objections achieve nothing except to make a skatepark for the youth of Steyning even less likely. 27th November - Press Release from SPC re MPF Village Green. The council has now reported the decision at its behind-closed-doors meeting of 19th November. No minutes or any other information on its website yet, however the following has been published in the Herald. This council will not de-register VG65. This council will not apply to the High Court for a rectification of VG93. This council shall not consider a 'land swap' of the land occupied by the bowls, tennis and cricket clubs at this time.............." It goes on to announce the establishment of a working party to make recommendations for future management of the MPF. We thank all our supporters for their hard work in helping to persuade the Council to reach this momentous decision. 20 November - Letter to SPC re VG93 and last night's Behind-Closed-Doors meeting. We wrote to SPC in advance of the meeting regarding both VG93 and VG65 because public statements made by SPC before the meeting suggested that either its legal advice was wrong or SPC was not reporting the advice or the basis for it accurately to the public. Both letters are set out below. No response from SPC, but that is now expected. When will the public find out what was agreed at this third meeting in the series at which deliberations have been held in secret? Will we ever know whether the decision was based on sound legal advice? It may well be that the legal advice you are obtaining regarding VG93 deals with this point, but as it is fundamental to the publicly expressed reason for this whole exercise we do urge you to ensure that it is both dealt with and clear to all councillors and made clear to the public after the meeting. The Council has stated that the need for rectification is because it thinks that the registration of the VG status gives the residents in favour of whom the VG is registered some sort of additional rights prejudicial to the residents of Steyning as a whole. It has indicated that these beneficiary residents can prevent other residents from enjoying sport and recreation and can deprive SPC of its proper management powers as owner of the land. It is the Council’s wish to reverse this unfair state of affairs. However IT IS ABSOLUTELY NOT THE CASE that these beneficiary residents enjoy a right which is prejudicial to other residents as users of the MPF or to SPC's rights as landowner - other than to ensure that SPC cannot use the land except for sport and recreation. The very thing SPC says is its aim. If there was even just a single beneficiary of the VG status that person’s only right which takes precedence over the rights of the landowner would be to enjoy unfettered access for sport and recreational purposes. The landowner can still give everyone else it wishes the right to do anything at all on the land so long as it does not interfere with that beneficiary’s right of access for sport and recreation. Obviously that consent for the wider public would almost always be restricted to sport and recreation. The single beneficiary’s right guarantees that the land is for ever available for sport and recreation and cannot be built on and thus guarantees it is also available for those purposes by everyone else. Accordingly, as landowner, SPC is entitled to allow anyone it wishes to use the VG93 area for any sport and recreational activities (so long as it has planning consent if that is required) because that use does not prejudice the right of those who have the VG93 benefit to also use the land for sport and recreation. Accordingly the existing VG93 registration preserves the area for sport and recreation for ever which means it can never be developed for an incompatible purpose and SPC as landowner can always give consent for all other members of the public to use this protected land for these uses. The existing VG93 registration is doing exactly what SPC says publicly is its aim – to keep the top half of the MPF open to all for sport and recreation for ever. The restrictive covenant that was mentioned as a means to achieve the same thing is neither necessary nor possible – a landowner cannot subject itself to a restrictive covenant. There would be no person entitled to enforce it. The only reason the skatepark cannot go ahead here, despite being a sporting/leisure activity, is that because it is so noisy any planning consent requires special features which are themselves incompatible with a village green, namely lockable fencing and restricted hours of use. Thus the only effect of going ahead to seek “rectification”, and if it was successful, would be not to preserve the area for sport and recreation for all as SPC has stated is its aim, but the opposite. The effect of successful rectification would be to remove the very safeguard which guarantees preservation for sport and recreation for all for ever in order to build a skatepark which is incompatible with the status and thus simultaneously leaving the whole top half of the MPF unprotected from any type of future development under any future SPC administration. As usual we have blind copied our supporters in to this and invite a response we can pass on, please. Also, please could you pass a copy on to Cllr. Willett and confirm you have done so? On 10th November you decided to further discuss the VG65 landswap legal advice when you had the VG93 rectification advice to hand. Accordingly we assume you will be discussing VG65 and Abbey Road on 19th November as well as discussing VG93. It is obviously important that this VG65 legal advice deals with all the relevant matters if the Council’s deliberations are to be soundly based. Please could you ensure that your VG65 legal advice refers to the case of Redcar which decided that pre-existing functions on a newly registered village green can go on as they did before registration. There has to be an element of “give and take” between those who had rights on the land before it was registered as a village green and those who have the benefit of the subsequent registration. This means that all the pre-1974 arrangements for the Tennis Club, Cricket Club and Bowls Club on the MPF, including restricting access to the Cricket Square for maintenance purposes, can continue as they always have. In weighing up which activities are dominant over, and which are subservient to, the VG registration the judge specifically warned about taking leave of common sense and entering a parallel universe where common sense does not exist. We fear that all this talk of the Clubs being unable to repair or refurbish or extend their premises, and the talk of bouncy castles being prohibited and Club premises having to be left open, or alcohol not being possible, or hiring out of premises being prohibited is doing exactly that. None of these is in fact a problem. Charging to enter a village green is not permissible, however charging to make use of facilities provided on the green (such as a tennis court or a lounge bar) is permissible. Also, with regard to developments post-1974 please would you ensure that your legal advice refers to the DEFRA Guidance that in deciding whether or not any given development is acceptable under the two protective VG statutes the court will be concerned with whether “material harm” has been caused to a green and whether there has been interference with the public’s recreational enjoyment? This guidance makes it very plain that enhancing the footings of a clubhouse are not going to be the problem SPC has so far said it will be. “Disturbance of the soil” to provide deeper or wider foundations is not an issue as there will be no material harm or interference. There is simply no problem over completely rebuilding a clubhouse on its existing footprint, including providing deeper foundations, and a larger clubhouse is also not going to be a problem provided it is for the better enjoyment of the Green. The only existential threat to the Clubs is not the VG status or the FoMPF but it is the risk of redevelopment pressures if the existing VG protection is stripped away from the areas the Clubs occupy as a result of SPC’s actions. In any event, it is our opinion that the Inspector would find the Abbey Road land is not suitable for exchange for three reasons – first, its location which is much less accessible to the beneficiaries of the existing MPF registration, second, its general inaccessibility due to the marshy nature of much of it, and thirdly the fact that the public already enjoys recreational access to it – both Defra and Pins guidance make clear that the land should not already be in use by the public if it is put forward as exchange land. It is a matter of considerable regret that, because the meeting is to be held in the absence of the press and the public when the Council comes to discuss these important issues, the public will not be able to hear whether or not the Council has based its decision on sound principles and legal advice. We hope that after the meeting you will ensure that the public is fully informed not only of the decision but of what factors governed the decision. As before, we are blind copying in our supporters and we also ask that you pass a copy to Cllr. Willett. Thank you very much. Here is a copy of the summons requiring our parish councillors to attend a private meeting at 7.30pm on Wednesday 19th November to discuss "rectification" of the Village Green status of the MPF. The press and the public are to be excluded so that all the discussions take place in secret. Since the Openness Regulations came into force - designed to bring about greater openness and transparency - the Parish Council has already had two meetings from which the press and public were excluded and it is now about to have a third. Despite the huge public interest and concern regarding the MPF village green status the Council is yet again discussing this behind closed doors so that no one will know what influence individual councillors have had, nor whether any decision is even based on a sound understanding of the issues. The confusion expressed by councillors regarding their existing legal advice during the debate on 10th November does not leave much scope for optimism about the issues being understood. For example the reason SPC says publicly it wants to remove the VG status from the whole of the top half of the MPF is because it wrongly thinks that the existing VG93 registration somehow gives those in favour of whom the registration has been made some sort of exclusive rights. No it does not. If only one resident had the benefit of this Village Green registration, SPC as landowner would still be entitled to allow everyone else to enjoy access - but that one person's rights mean that the VG can never be developed and so it is protected for sport and recreation for all for ever. These are the same councillors who are not only subject to the Openness Regulations but have also signed up to "The General Principles Of Public Life " as part of SPC's "Code of Conduct" which require that they be open and accountable. We have all paid for the legal advice with our council tax and we will all be paying yet more for any court case to seek "rectification". If the action is in the public interest why would SPC want to hide its reasoning from the public it represents? This is also the same council which has granted Cllr Lloyd a formal dispensation to allow him to participate on matters relating to the skatepark on the MPF. Because of a perceived conflict of interest under the Code of Conduct Cllr Lloyd used to remove himself from the debating chamber before the dispensation but he actively participates now. Here is the dispensation. Will he exclude himself from the village green discussion to which the dispensation does not extend? Presumably we will never know as there will be no minutes. 12 November - Parish Council’s reaction to our leaflet It is very concerning to learn that the Parish Council is adopting the technique of advising residents that our "Save the Village Green " newsletter has "misinformed" residents. We have seen this in an email to one of our supporters and it was stated at the Parish Council meeting on 10th November. This technique being adopted by the Council is one we have now seen on numerous occasions. It is to deny something which was never said and thus avoid addressing the substance of the thing which was said. So the Council says we have misled people because the Council has not yet decided to do the village green swap with Abbey Road and nor has it yet decided to try to remove VG status from the whole of the top half of the MPF. We did not say it had. Our leaflet sought support from the community of Steyning precisely to try to persuade the Council not to make these decisions. We said the Council’s intention was to seek “rectification” of the village green status (its own word taken from the relevant VG statute) which would involve removing the status from these areas and to that end it had sought legal advice. We subsequently advised you about the agenda item on 10th November which was to discuss the first step in the process of “rectification” - i.e. the proposed swap of village green status for the land occupied by the sports clubs with land at Abbey Road. At this Council meeting on the 10th November councillors appeared so confused about the options that no decisions were made other than to seek clarification of the legal advice. You can listen to the whole meeting by downloading the file from the following link. When you download you will see a warning that the file has not been scanned for viruses at the upload site. You can safely ignore this as you know the source of the file. So, no, the Council has not yet decided to do the VG65 swap of the Club lands or the attack on VG93 at the top half of the MPF, but it is taking all the necessary steps, with further legal advice now being sought, expressly in order to try to achieve its aim of “rectifying” the VG registrations. We all know the ultimate intention is a skatepark on the MPF regardless of the potential collateral damage the removal of Village Green status will cause. We think our leaflet was clear and true and that it is inappropriate for the Council to be saying that the Friends have “misinformed” residents. The secrecy of the Council and its failure in August, or in response to queries arising since then, to engage in candid and open discussion with the public about the Council’s aims is not only confusing the public but seems even to be confusing many of the councillors themselves. Many of you have seen the emails we have sent to SPC on this subject and will know that our honorary legal advisor has asked to meet to discuss the issues. He could at least help them with some of the questions they were struggling with at the meeting – such as the role of Horsham District Council in the event of a Club wishing to replace its clubhouse. All our messages are ignored. Remembrance Sunday. As our thoughts turn to remembrance, which for many in Steyning is focused on the Remembrance Garden in the Memorial Playing Field, we distribute our leaflet alerting the community that this precious area is under attack from our own parish council. See our leaflet here. 7 November - Police Overstretch. Drugs Baggies in MPF Children's Play Area The police admit that they are too overstretched to deal with drug-taking on the MPF. They claim that the wardens are patrolling instead. Has ANY resident seen them doing so? And the wardens have no power of stop and search. So what is going to happen when the same conduct as at Shoreham (see skaters' own complaints about drugs and violence and vandalism below) starts on the MPF? And remember the drug-taking has been going on in the fenced play area right underneath the CCTV. As we have always said - it is acting neither as a deterrent nor as means of apprehension because the specification is so poor and contrary to police advice to SPC. Letter to the police about drugs baggies here and complacent response here. "We would need to have an infra-red floodlight alongside the camera so that the image was the best it could be in the dark". We "would need to get a domed camera so youths could not identify where it was pointing". 31 October Intimidation at Shoreham Skatepark. 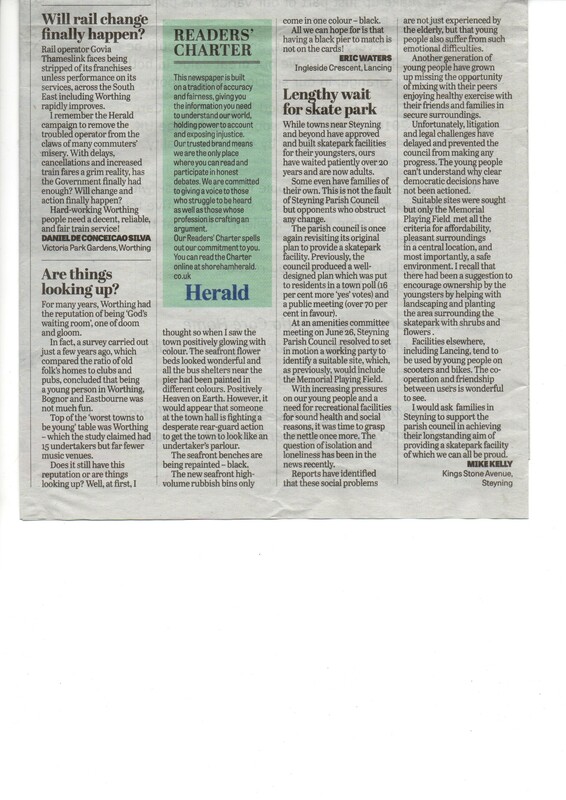 A Shoreham resident writes in the Herald about the antisocial behavour problems going on at Shoreham which the Authorities cannot control and the consequent feelings of intimidation for passers-by. Despite its location at a well-supervised easy-to-access location near the police station. What will happen at the MPF if a skatepark is built there, remote from supervision and with the police station sold off? And isn't this writer saying exactly what local residents have said to us and we have reported to the Parish Council? That they would not feel safe being responsible for the supervision in this remote location? I wouldn’t describe throwing bicycles and motorcycles at each other and smashing skateboards into the fencing as acceptable behaviour. Indeed, rather than being natural surveillance the behaviour is threatening and intimidating. 26 October - Illegal and Anti-social behaviour. There is a disproportionate amount of outrage being expressed on Facebook that we should on TV have made any connection between skateparks and antisocial behaviour and between that and the inaccessible-to-the-authorities and remote-from-supervision MPF proposed skatepark site. So here is what is written by skaters themselves about the Shoreham skatepark. Note the references to drugs, drink, vandalism including arson, violence, and tensions between different user groups. The skaters indicate that the skatepark has been overwhelmed by antisocial elements to the extent that they no longer wish to skate there. A "lost cause" to quote one of them. And to pre-empt Mr Kelly’s naïve mantra that Steyning is completely different to anywhere else; drugs baggies are repeatedly being left at the MPF (including at the picnic table in the play area right under the CCTV) – the police and SPC know all about this – and it only takes a very small minority, free to operate out of sight and supervision, for the problem to spiral. No one is suggesting that the young people of Steyning as a whole are responsible for anti-social behaviour, but the location of the skatepark needs to be one which deters rather than encourages the criminal or antisocial minority if our youngsters are to be kept safe. Let’s not forget that the Leisure Centre planning application was turned down on the grounds of “crime and anti-social behaviour”. And isn’t the user group exactly the same? And if the outrage about what we said about the MPF is genuine rather than faux* why no equivalent outrage expressed about the HDC Planning Committee’s views that the same young members of our community cannot be trusted at the Leisure Centre? And why do we keep hearing that the MPF skatepark will reduce antisocial behaviour from bored youth in the Town if everyone is the paragon of virtue Mr Kelly and other proponents claim? A skatepark might well have this desired effect, but only if it is in the right place. Marooned in a sea of grass on the far side of the MPF is not the right place. The Leisure Centre, which was originally the site preferred by the skaters themselves, is the right site. * Faux Outrage = Pretending one is offended, insulted or generally affronted by something which they really are not. The faux outrage is usually expressed publicly because it is done in the service of an agenda. - Source:- Urban Dictionary online. 17 October - An Appeal to Objectors to the Leisure Centre Skatepark – please help keep the options open. The MPF skatepark is looking very doubtful as the village green registration will need to be removed first. A very doubtful process likely to take years as it moves through the appeals process and is likely to cost SPC - and that's all of us council tax payers - upwards of £100,000. Even if that is successful the letter from Tom Crowley of HDC (here) makes plain that the facility would then have to be fenced off, or “caged”, which you have told us and the HDC planners would be unacceptable at the Leisure Centre Site. This fencing is also likely to be unacceptable to the Landscape Officer. So planning consent is unlikely. On top of that the two conventional noise experts say it will be a noise nuisance and will need to be closed down, again at the council tax payers’ expense. In the circumstances it is sensible to keep as many other options as possible open. The Leisure Centre is one such option. We are writing to SPC requesting it to re-consider its objection to the Leisure Centre Scheme and to take a neutral stance as the MPF skatepark planning application has been withdrawn and is currently not able to proceed. If you have previously objected to the Leisure Centre proposals and have received a letter from HDC telling you of the appeal, please give serious consideration to writing to the Planning Inspectorate at the address given in the HDC letter, withdrawing your objection. Objecting to the Leisure Centre does not make the MPF scheme any more nor any less likely but the Leisure Centre will remain an option if the MPF scheme cannot proceed and the planning appeal succeeds Your objection makes success a little less likely. That does not damage us, BUT MAY REMOVE THE LAST CHANCE OF A SKATEPARK IN STEYNING at the very location which at one time skaters said they preferred to the MPF. 15 October Mr Ian Alexander's latest advice to the skatepark supporters on Facebook? Put your fingers in your ears and close your eyes and you can ignore the overwhelming strength of the reasoned arguments from the FoMPF. Brilliant. For the benefit of those who do not have their fingers in their ears here is a very eloquent explanation of why the "democracy" argument by Mr Kelly, Mr Alexander (husband of Steyning Parish Councillor Mariella Alexander) et al for the skatepark being built despite its blighting effect on the lives of the nearest residents is so flawed. It comes from Lady Hale, the second most senior judge in the land. 13 October- Parish Council's statement exposes the development risk to the MPF if Village Green Status is stripped away. In response to a question from a member of the Public (not a member of the FoMPF) about the development risk to the MPF if the Council is successful in its attempt to "rectify" the village green registrations, the best the Council could offer is that it is "unlikely" that this or any other Council would wish to develop the MPF. Listen to Cllr Bowell's statement here and listen to the whole question and answer here. The photo accompanying the recording, by the way, shows what the council thought appropriate for the MPF until we objected to the CCTV mast's height and lack of paint. The current Village Green status completely prevents inappropriate development and "ensures the MPF is preserved in perpetuity for recreational and sports use for all the residents of Steyning" which the parish council claims is its aim. However, our parish council is now trying to do something which must be unique. A parish council trying to strip away its own community's village green protection so that it can build something which the village green protection prohibits. This protection means that the MPF is currently protected permanently for sport and recreation purposes for the whole community. Once that protection is stripped away the MPF is then unprotected from any type of development, not just a skatepark. Accordingly by removing the VG status the Council does the opposite of its stated aim and the only protection then becomes, as Cllr Bowell has acknowledged, the degree of unlikelihood of this or any future parish council's intention. And how unlikely is it that in the future a parish council will decide not to develop once it is free to do so? Anything from car parking to housing or even worse is possible. Already we have heard the suggestion at the September meeting from Cllr Barling that the police station could be used to house the Cricket,Tennis and Bowls clubs so there is already the possibility of some sort of linked comprehensive redevelopment of the Cricket clubhouse and/or the Tennis Club facilities and/or the Bowls Club facilities, the police station and MPF car parks and the changing pavilion if VG status is removed. Only VG status guarantees that these sort of inappropriate developments cannot take place. We have pointed out already how mere assurances, however genuine they may be from Cllr Bowell today, are absolutely no protection for the future. The supporters of the skatepark have already shown how a poll result calling on SPC never to build anything more, including a skatepark, is considered by them and the current SPC administration to be irrelevant just because of the passage of time. Does anyone seriously think Cllr Bowell’s words today are going to mean anything to a possibly cash-strapped parish council in maybe fifteen years’ time being offered millions to give up, say, the area from behind the bowling club to the Rublees for housing? Leave the village green protection on the MPF - it is this best guarantee it is possible to have under English law that the MPF will be preserved for recreational and sports use for all in perpetuity. After all, that is what the Parish Council says is its aim. Copied below is the latest bit of provocative, sarcastic, and personalising nonsense on Facebook suggesting that this dispute is a class issue and cynically trying to drag the Cricket Club into the dispute. The comment does at least acknowledge the current beauty of the MPF "Jewel in the Crown". Actually it comes mighty close to acknowledging what it is we opponents of the skatepark wish to protect. Read the judgment of the Supreme Court in the leading village green case of Redcar. Particularly the bit about “parallel universe” which this person really should have in mind. The cricket square was there before the VG registration. End of supposed problem. As he does not know what he is talking about in this connection it is perhaps best for this person to keep quiet on the subject of the VG rather than make points publicly on one of the most complex areas of English Law, based on no knowledge of the subject. This is not a class issue but a non-issue based on this person's prejudice and wilful ignorance which is designed to needlessly worry the Cricket Club in an attempt to embroil it in the controversy. Seemingly a policy - with SPC incorrectly claiming that the Cricket Clubhouse could not be repaired or rebuilt because of the VG status. And why anonymity from this person? If he wants to stir things up and suggest that there is a class war in Steyning let's at least have the community know who he is, what his qualifications for comment are and what personal prejudice he is carrying which leads him to think cricket is only for his class enemies and so the interests of the Cricket Club can be sacrificed in his determination to attack the village green status. We went for a stroll across the Memorial Playing Field this morning when the early showers had gone, sun glinting on the wet green grass. What a well kept beautiful place, I thought, with the South Downs as a glorious backdrop . The Jewel in the crown of Steyning. People were out walking their dogs and others were seated by the cricket club house. Then something came to my attention, a plastic fence held up by thick wooden poles surrounding the cricket crease and a large portion of the outfield. The FoMPF quickly came to mind. Oh no unfettered access! What are they going to do now? Will they complain to the council because an ancient right of way has been blocked? Will they castigate the cricket club for blocking free and unfettered access? Perhaps they'll just ignore it because this is a sport they approve of: balmy summer evenings, warm sun on your backs, seated on deckchairs eating cucumber sandwiches with tea served in bone china cups. Come on FoMPF what is your answer to this blockage to unfettered access? Village Green Law. Here as File 1 and File 2 and File 3 are three six minute clips (necessitated by file size limitations) which cover the questions regarding the village green. File 2 starting about half way through includes the question from a member of the public about the impact of the skatepark (not an FoMPF committee member) which resulted in Cllr Bowell's assurance to this member of the public. So the only defamatory statement is the propagandist's one that we are deceitful. And here for the record is the propagandist's untrue Facebook entry:- "....Everything FoMPF do is confrontational. We have just seen their latest posting on their website. There is a recording of Cllr Phil Bowell, Chair of SPC, speaking at the Full Council Meeting, 8th September.We were there and heard what was said. We are putting it in context and reveal the truth. On the recording we hear him say that the council will not build on the MPF or spoil its green, pristine beauty. He was responding to the scaremongering of the FoMPF when they had recently claimed that if Village Green status was lifted the council would be free to build (sic houses) there. Nowhere has Phil said the council will not proceed with its plan to provide a skatepark on the MPF. We now can see how the FoMPF are further misleading the residents of Steyning. Surely there comes a time when the FoMPF must be called to book for their deceit. Who is the person who placed this recording on the FoMPF website.? This must be libellous or defamatory. This cannot be allowed to continue. It is not possible to build the concrete skatepark and to honour this commitment. And why should we need a restrictive covenant (not possible anyway) when what the Council says is its aim is exactly what the village green status achieves? 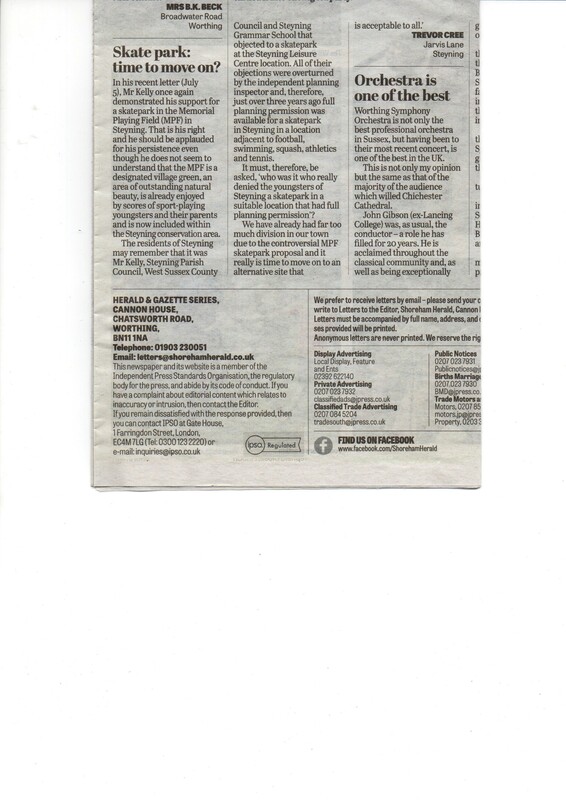 2nd October 2014 Press Release Published as letter in Herald. We think this letter encapsulates the Council's inappropriate attack on the MPF village green status which, if successful, will leave the MPF completely exposed to any kind of building development. "Steyning Parish Council claims that its aim in trying to remove Village Green status from the Memorial Playing Field (MPF) is "to ensure it is preserved in perpetuity for recreational and sports use for all the residents of Steyning". That is word for word what the existing village green status achieves. By attacking this status SPC is doing the opposite of what it claims and is leaving the whole area exposed to development of any kind. "..the FoMPF are promoting restrictive use of the field and clubs, which could lead to their demise....."
Untrue. It is precisely because we pointed out that the VG status requires unrestricted use and so the MPF must be open to all at all times that the skatepark cannot get planning consent as it would be too noisy. SPC is now creating problems for the Clubs which have not arisen in the last forty years and then laying them at the door of the FoMPF as a smokescreen. VG status is the strongest protection given to an open space by English law and SPC is attacking this status only because it wants to be free to build on the MPF. 2nd October 2014 Leisure Centre Planning Appeal Submitted. Here is the text of the message we have sent to Steyning Grammar School. We think it self-explanatory. We have been advised that our planning appeal has strong merits. "Unfortunately Steyning Parish Council has decided to try to remove the village green status which currently protects the Memorial Playing Field in order that it can resubmit its planning application for a skatepark at that site. We continue to believe that the MPF is the wrong site and so, regrettably, it is necessary for us to continue to try to demonstrate that there is an alternative and viable site at the Leisure Centre. Accordingly we have now lodged an appeal against the refusal of our planning application. As a courtesy, and as you have an interest in the land, we enclose a copy of the appeal form and the supporting document number 10. There are many more documents as listed in the application form but we do not wish to overwhelm you with these. Those that are relevant (other than the transcript) can all be seen at the HDC planning website. We realise that this will cause irritation or worse, but as we explained at the planning committee meeting, this planning application does not force anyone to do anything; it is merely an enabling first step and we hope that if the appeal is successful, and with the principle established in planning terms, you may be persuaded that this scheme will not have the negative impact you fear and that it has the potential for advantage in providing a facility for the School's exclusive use for organised games during the periods when it is locked shut; i.e during school hours. We regret that the unwillingness of the School to meet with us appears to make this a hostile action on our part. We would much prefer and would appreciate the opportunity to develop this further in a cooperative way as we think that the ability to lock the facility and to have a designated access route enforced under the management plan offers great potential for the whole community INCLUDING the School. Please could we ask you to pass this information on to all the foundation governors, to Mr Wergan and to all other interested parties? Thank you very much. 29th September 2014 Light at the end of the tunnel? We are pleased to report that as a result of meetings over the last ten days or so between Michael Bissett-Powell (who has been one of the main proponents of the MPF skatepark via Facebook) and our vice-chairman some real progress seems to have been made. Michael has published the following on Facebook which is self-explanatory. While this is not a fully worked through solution, it shows that by talking solutions begin to appear and misunderstandings can be set aside. We hope that this can be built on by everyone, but particularly SPC, and that SPC will re-consider its current refusal to discuss anything with us. We emphasise that this is entirely Michael’s document. There are a couple of minor factual errors in the preamble which we have drawn to Michael’s attention now we have seen it on Facebook, however we are happy to report that Michael confirms they do not affect the substance or his conclusion. This will REALLY upset a few people, but it is what I think ~and there is nothing in it for me! 1. MPF is NOT the only, or ideal, location for a skatepark. This concept has been promoted by SPC, who have not seriously investigated alternatives. 2. A town poll in 2000 resulted in 77% of voters agreeing to the construction of a small Scout Hut on condition that SPC never, ever, built a skatepark on MPF.When insufficient fund were available for the Hut, SPC reneged on the promise and built the “tarmac strip” and pursued the larger skatepark scheme. 3. In 2011 Survey by SPC 75% of those who responded indicated that they did not want a skatepark on MPF. a. SPC said the skatepark would NOT be in the SDNP, knowing that it would be. b. SPC said the skatepark would be ‘small’. This is wrong, it would be at least 3 times as big as a real ‘small’ , say,300 sq metre installation, for example at Cuckfield. c. SPC said they would not proceed unless the scheme met all necessary acoustic requirements. 5. In 2013 a town poll resulted in a relatively small majority in favour of the MPF skatepark. The choice was to vote ‘for’ so the children would have this much needed facility, or ‘against’ in which case there would never be a skatepark. 6. Subsequently the town became increasingly divided between FoMPF and a Facebook page devoted to comments by proponents. This became increasingly extreme, with possibly libellous statements, mis-information and personal abuse. As a democratically elected body working for Steyning the SPC should have acted for the whole of the town, but at no time did they intervene to calm matters. In fact, they promoted the concept that FoMPF were devoted to ‘spin’ and twisting facts to suit themselves. SPC have claimed that some of the requests for information by FoMPF have been ‘vexatious’, whereas an earlier Judicial Review brought by the Vice-Chairman of FoMPF resulted in the Judge stating that the requests were NOT vexatious. 7. The actions and possible errors by SPC have led to a further process of litigation which has yet to be heard, together with a personal writ against a Facebook contributor with the most extreme views for SPC and against FoMPF. No further details can be set out, for obvious reasons. 8. There are national government pressures to find land for housing, commercial and industrial use. Inevitably this will result in more intensive development of areas around Steyning, which is why natural environments such as MPF will become even more worthy of preservation. 1. SPC have done and continue to do many very good things for the town. The councillors are unpaid volunteers and I think they do their best. 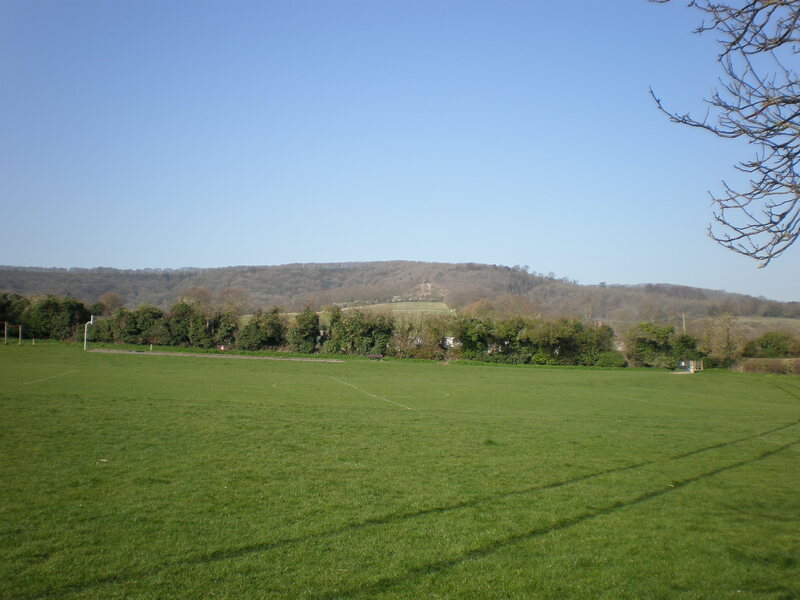 But they have badly misjudged the mood of Steyning by trying~ as is quite obvious ~ to push for a facility which the children and their parents are asking for, but which is on such a controversial site that it has divided the residents here. By clever manipulation SPC have somehow contrived to reduce a 77% vote ‘against’ down to a small majority ‘for’ the project. 2. FoMPF have secured Village Green (VG) status for the area where the skatepark would be built, so the project cannot proceed and the planning application has been withdrawn. If SPC manage to remove VG status so the project can be re-submitted for approval, then FoMPF will appeal against a decision in favour of its construction. This will cost time and money. 3. If, somehow, SPC win an appeal and proceed, then close monitoring of sound from the facility may result in an injunction and possible closure. This is a risk which SPC should not be taking with ratepayer’s money as it will result in huge legal and other costs to the residents via their Parish Council rates. 4. I think SPC should return to the promise made in 2000 and re-affirm their commitment never to build a skatepark on the Memorial Playing Field. In return, FoMPF should withdraw their application to make the Fletchers’s Croft area a VG. 5. SPC should investigate a “land-swop”, in which the outline of VG65 is re-drawn so as to exclude the Cricket Pavilion, tennis courts and bowling green. In return land on Abbey Road should be given VG status. This will free the existing sporting facilities on the MPF to repair or re-construct their facilities free from VG restrictions. 6. The whole town should support a genuine effort to locate and promote alternative sites ~ which DO exist ~ in spite of predictable opposition from some residents. Solutions do exist in areas not designated as Village Greens and these will allay their natural concerns. And if we get it wrong, then we won’t get planning permission. 7. A serious suggestion: we should seek a small and relatively safe skatepark on SPC land, for young children up to, say, 11 years. Then the Leisure Centre proposal could be re-worked to provide a “skate club” for teenagers, with paid-for membership etc. A full Business Plan should be devised and discussed with the owners of the Centre. A new scheme should also be submitted to the Grammar School, this time agreeing to operating hours outside school time, no need for access via their grounds etc. Ultimately, we would go from ‘no skatepark’ to ‘two skateparks’! There are serious reasons for splitting the ages: evidence is emerging of dangers to small children on scooters and skates when older skateboarders and BMX riders want to travel at greater speeds. Injuries have already occurred. I have spoken to, or had contact with, representatives from FoMPF, the Parish Council, supporters of the MPF skatepark and many others. Without exception they have been helpful and pleasant even when I have not always shared their views. Steyning is a unique place with wonderful people. We all love the place! there is a way through this little disagreement, so long as we remember the children and do what is best for them. 25th September Democracy. An explanation about the “democratic mandate” which many on Facebook who have mentioned democracy may find helpful. It is quite long but as it is a matter of such importance and is the argument most raised against us we ask the reader to bear with it and to read the whole thing with an open mind. After this explanation, can we please move on from the idea that we are “undemocratic” and concentrate on the real issue - which is to try to find a solution which is acceptable to the whole community? The current proposal on the MPF is going to upset half the Town even if all the problems are overcome, and the whole Town if the village green problem is overcome but the noise one is not and so the skatepark has to be removed after installation. Many seem unaware that in September 2000 there was a town poll about a twin proposal for a scout hut and a skatepark on the area of the MPF where the skatepark is currently proposed. The poll motion was to achieve a compromise of a scout hut but nothing else, ever, on what has now become VG93 where SPC wishes to build the latest iteration of the skatepark. 1 A low impact scout building should be allowed adjacent to the Bowling Club. 3 There should be no further development on this part of the Memorial Field (including Rublees Allotment site) by this present or any future Steyning Parish Council,"
The scout hut was granted planning consent but never went ahead because of funding problems. Despite the poll result the Parish Council then went ahead anyway and built the unloved, hardly used, tarmac strip for skaters. Was that action by SPC “democratic”? And in view of the overwhelming majority vote that "There should be no further development on this part of the Memorial Field (including Rublees Allotment site) by this present or any future Steyning Parish Council" is it democratic for the supporters of the skatepark to now seek to build there? Particularly as the VG status merely enshrines this poll result? Then we had the town survey carried out by SPC itself. This revealed that 75% of households did not want a skatepark on the MPF. This should have been the end of it. But instead of complying with this completely democratic result and despite the earlier poll with its even larger majority, SPC ignored both and decided to press on. Most people would surely agree that a fundamental requirement for a democratic decision is that it should be based on true and open disclosure of the facts. •	SPC said the skatepark would not be in the National Park when it knew that it would be. •	SPC described the skatepark as “small” and gave everyone the impression it would be about the size of the existing tarmac strip – when in fact the overall development would be very much bigger – at 1200m2 about six times the size of the 200m2 tarmac strip, with the skatepark and bunding area about four times bigger. •	SPC said it "would not think of going ahead" if the conventional noise criteria were not complied with. They are not complied with. Not even nearly. And yet it has pressed on regardless. This is the most serious problem as the noise is the thing which will likely close the skatepark down even if it does get built. So there never was an accurate portrayal of the scheme and of SPC’s intentions on which the public voted. And other circumstances have also intervened to invalidate this vote even more – for example no one at that time knew that half of the MPF was already a village green and the other half satisfied all the necessary criteria. We do not think any reasonable person would think it inappropriate or “undemocratic” to continue to campaign against the skatepark in these circumstances. Only when the result went the way the Council wanted it to, did it decide it now had a “go-to-any-lengths” mandate. SPC also manipulated the wording of its poll to wrongly imply, again, that the skatepark was about the same size as the tarmac strip. Cllr Bowell also claimed in this message to the Town delivered just prior to the poll that the area was unsuitable for any pitch-based sport, even though there was a football pitch marked out there at the time. The pitch drawn on the leaflet was neither the size of nor shown at the location of the actual pitch. And incidentally there are no toilet facilities on site (as Cllr Bowell stated) which are useable by skaters. Right to the end SPC never made clear how it intended to resolve this. This is what Cllr Bowell said (see page 2). And here is a photo of the pitch which was located right next to the existing strip and well into which the new skatepark would have encroached. This shows the area "considered unsuitable for any pitch based sport" by Cllr Bowell at the very time the leaflet was distributed. The poll was also based on a completely different design to the one we finally ended up with. Also, those voting were not told that two noise experts had said the skatepark would be too noisy and liable to be closed down as a noise nuisance. Nor were they told that local residents have legal expenses to enable them to seek an injunction to close it down if the two experts are right, nor that it seems the Council has no legal expenses insurance for this. Those voting were not told that if the injunction is obtained the cost of dismantling the skatepark and paying damages and costs to the residents will fall on the tax payers. The Council laid down the ground rules prior to the poll. It specifically said that the result would be a factor, not a mandate. In all the circumstances we were perfectly entitled to go on pointing out the flaws in and, ultimately, the illegality of, the scheme. It should not have gone ahead after the Council unequivocally said it would not think of going ahead if it did not meet the conventional noise criteria. It should not have gone ahead when it emerged that half the MPF was already a village green and the other half satisfied all the criteria. Nor when it merged that disabled users and spectators cannot get close. The history made it entirely appropriate that our campaign should continue. If we had done nothing and kept silent the Council would have inadvertently produced (inadvertently because it neither had the expertise nor was willing to pay for the appropriate level of expertise but instead relied on the, hardly impartial, installers for its advice) a structurally unbuildable and visually inappropriate mound of earth engulfing an unsuitably noisy facility approached via an insensitive tarmac strip laid across the MPF in breach of the terms of SPC’s legal right of way, and leading from an “approved access route” up from Mill Road which no one could use in the slightest inclement weather, let alone those with a disability. It would have included a visually unacceptable car parking area and it would have been in breach of RoSPA guidelines, so probably uninsurable. It would have been overseen by a CCTV system in breach of planning laws and Data Protection Regulations and which could not actually see the facility anyway. And we had told the Council over two years ago (well before the poll, though it declined to publicise this) all the reasons why VG status would make the skatepark illegal and so unbuildable. Even the keenest supporter of the skatepark and the greatest apologist for SPC should be able to accept that our interventions served a useful purpose and saved the scheme from what would have been an unbuildable financial disaster. The poll did not require that we remained mute in the face of all these problems and in fact revealed that, far from being the small carping minority we were being portrayed as, that we represented the views of a very substantial number of the residents of Steyning. Also, let’s not forget that both the Council’s original independent noise engineer and our noise engineer - who as an expert witness is also independent of those instructing him (the integrity of an expert witness would otherwise be completely destroyed) - each say that the facility will be too noisy and liable to be closed down as a noise nuisance. Only Acoustic Dimensions who we understand to be noise engineers put forward by the skatepark installing company itself predict no problem. And the technical errors in AD’s reports are set out in the Saunders’ reports. SPC refuses even to listen to a presentation from Saunders. So the likelihood is that if the VG status is removed (and we will fight that through the courts) and the facility gets funding (unlikely unless the WMT are willing to put up and gamble the whole build cost, given the predictions that it will be closed down as too noisy) and it actually gets built, then an injunction will almost certainly close it down again almost immediately. In the meantime, to get it that far, the MPF will have been stripped of its village green status so exposing it to risks of other unsuitable development. This is why a satisfactory alternative solution must be found. 24th September 2014 An explanation to dispel an unhelpful myth about the number of meetings with the Parish Council. If only that were so we might not all be in the mess we are in now. In fact SPC has consistently refused to meet with us at all regarding the MPF skatepark or the village green, despite since the poll knowing that we represent the views of very many Steyning residents.. We have had only two meetings with SPC. They were both about the Leisure Centre. The FoMPF would be delighted if this contributor asked SPC for these details and then published the response as the information he/she has been given is just wrong. Without knowing the identity of the Facebook contributor it is not possible to assess whether this is someone who has been misled or someone who is doing the misleading - but unless and until the contrary emerges we are happy to assume the former. Maybe it would be a good policy for Facebook to require contributors to give their name? For our own part we confirm that our postings are collegiate in nature, being a joint effort prepared and approved by our whole committee (details on website) before being uploaded. The accurate facts are that SPC has never discussed the MPF skatepark with us and has REFUSED to do so three times - many more if you count the several attempts on each occasion. As incidentally did leading members of the proponents (specifically Mr Kelly and Mr Brewer) as did the Wilson Memorial Trust. As did the School governors. We have always been wanting to meet, but our offers were always spurned, with just one exception. Peter Walsh met with us once to discuss our concerns about the AD noise report. In fact we have very recently asked again to meet with the Council to discuss its village green intentions and ours, as well as the skatepark, and this has been completely ignored. Informally we have heard that this is because SPC claim their lawyers have advised that a meeting would be inappropriate. This is what our vice chairman said to SPC in response. This too has been ignored. I am disappointed not to have had any acknowledgment to my request of 7th September (below) on behalf of FoMPF for a meeting. I understand you bumped into **redacted** today and that you told him that you had been just about to reply positively when coincidentally you received the long-delayed directions order in my ongoing appeal regarding the refused FoI request, and that because of this you were relying on the advice previously given by SPC’s lawyers that you should not meet with me. Frankly I do not think that this is a reason not to even acknowledge receipt and give me the reason for declining the request. You gave it to *** when pressed so why not to me? I have many years’ experience of litigation and I do not know a lawyer in the land who would advise that a meeting to discuss issues was inappropriate. This would be completely alien to the philosophy which underlies the Civil Procedure Rules. Obviously issues relating to any ongoing litigation would normally be discussed under the auspices of a lawyer, but there is no reason why matters unrelated to ongoing litigation, as had been my intention, should not be discussed direct. In any event the solution would be to have the discussion either at SPC’s solicitor’s office, or elsewhere with the solicitor present. Not to have no discussion at all. I remain happy to meet in those or any other conditions. SPC has had just two meetings with FoMPF and these were to discuss the Leisure Centre scheme, not the MPF one. And there has not been a single meeting with our vice-chair. Check out the first document in the link at the next paragraph. The “olive branch” letter sent by our vice chairman in 2012 which the Council rejected saying there would be no point in a meeting and later described to the planning department as “threatening”. Really? Also check out here the numerous attempts by the FoMPF to meet with SPC prior to the extraordinary meeting of 11th June 2013. The one where we were accused of “throwing it back in the Council’s face”, “wasting the Council’s resources” and “refusing to meet”. Any fair minded person reading this will see that the Council’s conduct was very different to what it portrayed publicly. MEETING BETWEEN MICHAEL BISSETT-POWELL AND PAUL CAMPBELL Paul Campbell (Vice-Chair of FoMPF) and I met this weekend to see if the increasingly bitter division in Steyning regarding the skate park could be halted. It was a surprisingly enjoyable discussion and not the brain-washing which some had suggested. We respected each other’s view on the skate park although clearly we are still on opposing sides. Both of us want to build on the few aspects upon which we can agree, in the hope that it may slow down or even stop further acrimony. b) Nobody on either side of the argument is ‘against’ children or their recreational activities and if a skate park is constructed in a location which can be monitored and policed (such as in Facebook’s mention of Dorchester where there is passing traffic and it is next to the police station) then there is some evidence that anti-social behaviour may be reduced. c) We agreed that the top end of the Memorial Playing Field cannot be described accurately as the ‘ideal’ or ‘only’ location for the skate park because a significant number of town residents would find it unacceptable. I am inclined to the view that no location will ever be perfect for everyone. d) I asked Paul Campbell to accept that some of the comments on the FoMPF website were unduly forceful. Paul agreed that in future postings he would try to consider the opponent’s point of view so as to avoid antagonism. In return I agreed to ask the supporters to temper some of the more extreme comments on Facebook. e) We discussed the Steyning Parish Council and I made it clear that in my personal opinion asking for the whole Council to resign was a step too far, if only because it would add another twist to the spiral of animosity and scandal which we are so keen to prevent from now on. Having said that, I was presented with incontrovertible evidence that the Steyning Parish Council have made mistakes. The difference between Paul and me is that I want to think of occasional lapses of good management as accidental, whereas he believes that a combination of mistakes and a resulting unduly defensive attitude has led to lapses of integrity. It is fair to say that we agreed to differ on this point! f) I have always said that I support the MPF skate park because I am constantly told there are no other suitable sites. Nobody would deliberately set out to upset a group of Steyning residents if a workable alternative presented itself. Paul and I agreed on this point. I really want to heal the wounds on this matter and any common ground is better than none. If you think I am wrong then I will happily take a back seat and just watch from the side-lines. 19th September - Parish Council Attacks Its Own Community . A long but very important explanation. In order to justify its attack on the top end MPF village green (VG93) so that it can build the skatepark, the Council is cynically stirring up non-existent problems on the unrelated 40 year old lower end MPF village green (VG65) where the Clubs are situated. It is deliberately muddying the waters to blame the FoMPF and to try to persuade the community that the attack is necessary. It does not care that it is now creating very real, but previously non-existent, problems for the Clubs - anything can be sacrificed to the skatepark project, including its own integrity it seems. Does it not think the community will see it as a remarkable coincidence that as soon as the skatepark cannot go ahead due to the VG status, SPC suddenly says that the VG status poses such overwhelmingly serious problems for the Clubs that the problems now must be addressed by attacking this VG status? SPC claims that its aim is "to ensure the MPF is preserved in perpetuity for recreational and sports use for all the residents of Steyning" (WSCounty Times Sept.18). That is EXACTLY what the existing VG status achieves. By attacking the VG status SPC is doing the exact opposite of what it claims and is leaving the whole area open to development of any kind. VG status is the strongest protection given to an open space by English law and SPC is attacking this status only because it wants to be free to build on it. There is no need for the restrictive covenant he offered (which cannot be granted by SPC anyway for technical legal reasons). The current VG registrations precisely achieve this claimed objective already. So if what Cllr Bowell said is true what possible reason can there be for attacking this protection given to VG65, let alone VG93? And those of us with longer memories will know not to trust any promise from the Parish Council which can be ignored by a successive one. Which will be the situation after May. The Council obtained a grant to move the play equipment to its current location on the basis that it would not be fenced so that the open views would be preserved. And then its successor (the current council) reneged because there was no legally binding restriction in the grant. This is also the same council which said it would not think of going ahead with the skatepark if it did not meet the standard noise criteria – and then it did the opposite. So nothing the Council says can be trusted for the future. Only external constraints like VG protection can control its conduct. VG status gives protection to the land. It does not matter if it is one local resident who has the benefit of the registration or ten thousand. The land is protected for sport and recreation purposes for those residents and so cannot be inappropriately developed. The knock-on effect is to protect the open space from inappropriate development for the benefit of everyone. And the VG protection for the benefit of that one or ten thousand people has no effect on property rights. The landowner remains the landowner (in this case SPC) and so it can continue to give consent to whoever else in the general public it wishes to make use of the protected open space for sport and recreation. The VG protection has no effect whatever on SPC's continuing right to permit any member of the wider public to use the MPF for sport and recreation. This cannot be stopped by any resident, including the FoMPF - who would have no wish to anyway. The claim that FoMPF by registering the VG93 has somehow acquired property rights which allow them to control who goes onto it is completely bogus and without any foundation whatsoever. VG status ensures that the MPF is preserved in perpetuity for recreational and sports use for all the residents of Steyning and incidentally for the wider general public too - exactly what SPC claims it wishes to achieve by attacking this VG status. The problem with the skatepark is that precisely because VG status does protect the right of anyone to use the MPF for sport and recreation at all times, its hours cannot be restricted and HDC considered it would be too noisy and the management plan would be unenforceable. This is utterly untrue and SPC knows it. It is precisely because we pointed out that the VG status requires unrestricted use and so must be open to all at all times that the skatepark cannot get planning consent as it would be too noisy. So the true position is the opposite of what the Council says. And the VG65 on which the Clubs operate is nothing at all to do with the FoMPF who have said and done absolutely nothing with regard to what goes on there. And nor would we. This is SPC creating problems and then seeking to lay them at the door of the FoMPF for its own political ends. Just as its press release about the reasons for the planning delays was untrue, and its denial on the 8th that its press release had given the so-called reason for the planning delay was untrue, so is this latest press release untrue. An explanation about the two completely separate village greens and the Council's attempt to muddy the waters. There are two completely separate village greens. Registered in 1974 on the basis of SPC's 1969 application (delayed because WSCC was overwhelmed by large number of simultaneous applications). SPC stirring up problems now and inventing non-existent ones claiming wrongly that bouncy castles can't be used (actually specifically excluded from its public liability insurance policy anyway) and that Club premises cannot be repaired or replaced. They can. Including the footings.. Instead of letting sleeping dogs lie, SPC is searching out every theoretical problem it can and then claiming falsely that it is all down to FoMPF and that the "problem" needs to be sorted out. How does SPC think every other village green in the country operates? Does it seriously think it is going to be prosecuted for some imagined offence which has been going on for forty years? SPC is cynically stirring this up only to muddy the waters and justify its attack on the unrelated VG93 where it wants to build the skatepark. SPC wants to remove the VG registration claiming that it was "unauthorised" even though the then chairman of the council, the late Cllr Blackie, swore a statutory declaration to say he was authorised. Not content with its own integrity being besmirched by its conduct, SPC is happy to attack the undoubted integrity of a person who cannot answer back. If the VG status is successfully removed all protection has gone. Any development is possible. This covers the top half of the MPF (not "a small area") as Facebook claims. Not "selfishly for themselves" as Facebook claims. Here is the application form showing we applied for all of Steyning. See question 6. It was registered by WSCC for the nearest residents instead of the whole of the parish council's administrative area only because of SPC's opposition. It does not matter how few residents are beneficiaries, the effect is to protect the open space for recreational and sports use for all. The FoMPF does not acquire any property rights of veto as Facebook and the Council claim falsely (see explanation above). The council wants to remove VG status, not as it claims "to ensure the MPF is preserved in perpetuity for recreational and sports use for all the residents of Steyning", which is exactly what VG status achieves, but so that it can build a skatepark which is inimical to the open space which VG protects. Without this protection the whole area is then vulnerable to any other type of development. 11th September. Parish Council. Two projects. Two secret meetings. Two sets of untrue statements. SAVE THE MPF VILLAGE GREEN CAMPAIGN STARTS! At a meeting on 19th August from which the press and the public were excluded, the Parish Council resolved to try to remove village green protection from the MPF. The public does not know which councillors attended, what arguments were discussed, nor who voted. We suggest that this is highly inappropriate for such a major decision. The Council’s following untrue statement then started its “Attack on the Village Green Project”. At the meeting on 8th September the public was told that the forty year old registration of the village green, made by the parish council itself, was “unauthorised” and needed to be “rectified”. As we can all see, this is untrue. “I am the Chairman to the applicant and am duly authorised by the applicant to make the foregoing application”. Does anyone seriously believe Mr Blackie would have sworn this statement if he was not authorised? The Council also claims there is nothing in its minutes about this application by Mr Blackie. So we have inspected those minutes in the archive. The truth turns out to be that there are no fewer than 17 separate references to the process under the Commons Registration Act 1965 all leading up to Mr Blackie's application to register the MPF as a Village Green. The Council’s skatepark project ends with a meeting in secret and with untruth. At a meeting on 19th August from which the press and the public were excluded, the Parish Council resolved to withdraw the planning application. The public does not know which councillors attended, what arguments were discussed, nor who voted. We suggest that this is highly inappropriate for such an important decision. The Council’s following untrue statement then announced the end of the planning application. The Council’s press release said that the extreme length of the planning process was because "..the Parish Council has followed the recommendations and suggestions of the professional bodies consulted and the officers of the District Council to fine tune the planning application in order to fully meet the environmental, landscaping, sound and equality issues raised. This action was taken with the genuine desire to mitigate the impact on local residents of any noise disturbance." See the full statement here. Not only is this untrue because not one change was made to mitigate the impact and, to the contrary, a major change was made which significantly increased the noise impact (removal of noise attenuating bunding) - but when asked about this at the meeting on 8th September the Council made another untrue statement. When asked to identify a single change in the planning application which was aimed at mitigating noise, Cllr Bowell denied what we can all see, he wrongly said that the press release had said nothing about any changes to the planning application. And he can hardly claim he had forgotten the press release's false claim that the delays had been due to the genuine desire to mitigate the noise impact – we wrote to him and the other councillors about it just three days previously when we sent them the posting of 5th September (below). So the Parish Council ended this process with untruth – a process it started with untruth when it denied the skatepark would be in the National Park - when it knew it would be in it because the Park Authority answered its query about this immediately before the public meeting on Saturday 28th January 2012. And it also falsely promised at this meeting “not to think of” proceeding if the skatepark did not comply with the conventional noise criteria - and then it pressed on regardless. We are constantly being told that we are "undemocratic". We suggest that it is fundamental to democracy that an elected representative body like Steyning Parish Council should always take the greatest care to give the public all the information it can, and that it should make sure the information is accurate to the best of its ability. Regrettably, this council does neither and we see history repeating itself as the Council embarks on its “Attack on the Village Green Project”, based again on untruth right at the outset. "......Steyning I now know will never ever have a skatepark here ....."
we will take a break and await developments. We would like to acknowledge and welcome the fact the MPF has enjoyed perhaps its busiest year ever with children and young people of all ages clearly enjoying the MPF immensely as it is – without a skatepark and in harmony with the whole community. Long may this continue - which the village green status guarantees. For ever. 8th September 2014 Mr Ian Alexander Mistaken. The situation is the reverse of what he thinks. As Mr Alexander has the ear of the Council and so is probably feeding in what he hears from that source this is very worrying for the community as it means the Council will be making its decisions on a complete misapprehension. We are happy to accept that Mr Alexander is mistaken rather than deliberately giving out misinformation but it is important that this topic should be understood by everyone and this sort of mistake is very harmful to the community as it stirs up division on the wrong premise. The MPF currently IS for all of the people all of the time. The Council is the landowner and so by merely doing nothing every member of the public has free access to the MPF. Only the Parish Council has any power to restrict this. No one else, including the FoMPF has any right or power to prevent this. It ALSO has VG status which means that even the Parish Council as landowner cannot restrict access (though obviously the Clubs which were there before the VG status was granted have their amenities unaffected). This is precisely why HDC has said it cannot grant planning permission. Because with VG status skateboarders would be able to use the skatepark 24/7 and the skatepark cannot be restricted to dawn to dusk. Not by the FoMPF nor even by the Parish Council. For the same reason anyone playing football on whatever part of the MPF they are playing cannot be stopped by anyone. Not by the FoMPF nor even by the Parish Council. What Mr Alexander says is just plain wrong. The situation is the reverse of what he says it is. The difference between skateboarders and footballers is that the former need a facility requiring planning permission while the latter do not. Hence Horsham planning department’s intervention. It is because the Parish Council does want to be able to stop activities which are currently lawful on a village green 24/7 that it intends to attack the VG status. This is so that it can close the skatepark at dusk. To do this it wants to roll back the VG protection and thus not only create the conditions under which the skatepark may be granted planning permission but also create the conditions under which any other type of development can take place. That is why its desire to remove VG status from the MPF is so dangerous. “We’ve had to recently refuse a lady who wanted a bouncy castle for a child’s party. We may have severe problems with rebuilding the cricket club which is in a bad state of repair. We felt it appropriate to withdraw our planning application and concentrate our efforts on rectifying the Village Green status on the Memorial Playing Field”. First, the clubs and the proposed site for the bouncy castle are all on that part of the village green which was registered 40 years ago by the then parish council. Nothing to do with the Rublees area supposedly “improperly” registered by us. So even if that registration was successfully attacked it would have no bearing at all on the claimed problem. Second, the disrepair of any structure on the VG is not a problem anyway. There is absolutely nothing about VG status which has any inhibiting effect at all on repairing, or even rebuilding any existing structure so long as it is on the same footprint. And why should a bouncy castle be a problem? Try Googling “images” and “bouncy castle village green” and there are village greens all over the country where bouncy castles and much more are used on village greens in connection with fetes etc. These claims of problems are no more than an attempt to whip up support among club members for the Council’s decision to attack the village green status. Why? Purely so that the Council can try to appropriate the site for a facility which is so alien to the location that it cannot be built there unless the VG protection is stripped away. The Parish Council should be the stewards of the unique character of the MPF and should be doing all it can to keep the MPF open for all to enjoy any grass-based activity for all time. Exactly what VG status achieves. Instead, SPC wishes to roll back the existing VG protection so that it can permanently change the MPF’s character for the worse. Without the protection of VG status there will be nothing to stop more and more hard surfaces and even buildings (lavatories? ), car parking, lighting columns, cctv masts, theoretically even housing etc. etc, appearing on the MPF. All of the clubs have operated perfectly satisfactorily for forty years on the village green and nothing has happened to change this. 1 That the extreme length of the planning process was because repeated changes were being made “in a genuine desire to mitigate the impact on local residents of any noise disturbance”. This claim is completely false. The only change relevant to noise was to REMOVE the noise attenuating bunding which the Council’s own noise engineer, Atkins, had said was essential, thus INCREASING the noise impact. None of the later changes – the subsequently reversed introduction of inappropriate car parking and access route, the introduction of planting, etc. has anything at all to do with mitigating the impact of noise disturbance. Nor was putting right the DAS and the management plan which SPC had not noticed was incomplete until we pointed it out. SPC has actually done nothing at all to mitigate the noise impact – it merely obtained a second report from AD (because it did not like its original one from Atkins who said the facility would be too noisy) which is deeply flawed and then closed its ears to what Saunders has to say about this second report and regarding the noise nuisance. It has refused even to listen to the presentation Saunders gave to Horsham Council and offered to give to SPC. All SPC has done is to deny that there will be any disturbance and to ignore for months the evidence that the first of the AD reports was based on noise readings which had been deliberately corrupted by some of the proponents of the MPF skatepark. It has also completely reneged on the unambiguous assurance the councillors gave right at the outset that SPC “would not think of going ahead” with the project if it did not comply with the conventional noise criteria. It does not, but they have pressed on regardless. So the delay in the planning process was nothing whatever to do with a desire to mitigate the noise impact. The Council has shown it is completely unconcerned about the noise impact and has removed the one thing its engineer said might make the facility acceptable. 2 That SPC has had “wonderful support from a majority of the residents of Steyning”. This is simply not true either. There are over 6,000 residents of Steyning and so to be true it would have needed to have had support from over 3,000 residents. The truth is that even the poll (which was based on a different design - before it was known for example that the disabled would be excluded and with many residents still thinking there was noise reducing bunding, and with the wording of the question deliberately skewed to continue to improperly suggest that the skatepark was the “small” one as described at the original public meeting, and with serious misstatements in the Chairman’s message distributed shortly before the poll)- the result was 816 in favour and 703 against. Thus, far from expressing support for the council, the majority of the Town has expressed no view at all. 3 That removing the village green status is because the Council is “having due regard to all other users of the MPF” and that removing the village green status is “for their future benefit” again stands the truth on its head. The current VG status benefits all users of the MPF in perpetuity and every other community in the land lucky enough to have a village green is proud to have one. These other communities manage to accommodate cricket and fetes and, no doubt, bouncy castles as well on their village greens. The claim (reported to have been made by Chairman Bowell according to Bright FM) that these are suddenly threatened after forty years of VG status is just plain wrong. The only beneficiaries of removing the status will be the minority of supporters of the skatepark who will have the village green despoiled and the nature of the MPF changed and degraded if this goes through and part is permanently appropriated to a use which is so different to and inconsistent with all the other low-impact grass-based rural activities that are currently enjoyed there. The existing situation allows all the current users and uses to continue exactly as they always have over the forty years since the MPF was first given VG status by a parish council which at that time wanted to protect the MPF from inappropriate development and to keep it a grassed open space for the recreational benefit of its residents for all time. Incidentally, the Friends would like to acknowledge and welcome the fact the MPF has enjoyed perhaps its busiest year ever with children and young people of all ages clearly enjoying the MPF immensely as it is – without a skatepark and in harmony with the whole community - including the Friends who some of the Facebook contributors continue to try to portray falsely as haters of children and fun. Interesting then that, after more than two years of campaigning, the proponents’ Facebook page has managed the grand total of fewer than 400 “likes”, many solicited from other skatepark sites and users, despite these large numbers of potential users and their parents. And it is parents who are the dominant campaigners and Facebook contributors with youngsters playing virtually no role at all on the site. They just do not seem to be interested. “12 There is no student voice from within the School regarding the provision of a skateboard park”- letter 14th June 2013 from Chairman and Governors of Steyning Grammar School to HDC Planning Department. There seem to be but a few lone voices going round in circles on the Facebook site. 3rd September 2014 A Proponent’s Skewed Perspective? "they don't give a damn about anyone else, how their wants affect anyone else in our community. Self-obsessed"
is a recent posting on the MPF skatepark proponents’ Facebook. But isn't that exactly the problem stated in reverse? Those who want a skatepark don't give a damn about the local (many of them long-term) residents, whose lives will be blighted by the noise etc. and who simply want to be left with the facilities on the MPF exactly as they are. Ditto the dog walkers, picnickers, and many other types of user who wrote to HDC objecting and who simply wish to maintain the status quo. Is protecting the status quo really such self-obsession compared with those, many of whom have come in from outside Steyning, who have decided they want to appropriate the area for their wants and don't care about the negative effect on others? They have come to Steyning from places like Brighton, presumably attracted to Steyning’s special features, and then set about turning it into a suburban rather than a country place - destroying the very features which attracted them in the first place. "Don't let a bunch of fools like them push you out of such a beautiful village. My view is this-i'm assuming that most of them are ancient (who else would have so much time on their hands?) The population of steyning is getting younger, as so many of us have moved here to have our families. So soon a lot of those children will be older, become voters and be able to help campaign against old fuddy duddies who are against children having fun.! The Friends are constantly accused by Facebook postings of being bullies. This is an odd way to describe those who just want to be left in peace and are defending the quality of their lives from those who want to steam-roller them and who just ignore the professional noise reports because the content does not suit them. The parish council calls us “bullies” too, but what it really means is not that it is being bullied but that it is being held to account and that it does not like this. SPC is simply being required to comply with the laws, rules and regulations and basic openness and truthfulness all of which underpin the democratic process we are constantly being lectured about by Facebook proponents of the skatepark – at least one of whom was responsible for the dishonest corruption of the noise report readings. The rule of law is a basic underpinning of democracy, as is honesty and openness by elected representative bodies such as SPC. We hope this comment may help these Facebook proponents of the MPF skatepark who read this to consider that there might be another perfectly reasonable perspective which is different to their own and that their allegations that we hate children, and that the dropping of the planning application means that we and HDC and WSCC and even the parish council are corrupt, are highly inappropriate. In fact these comments and the implicit threats contained in some of the more unreasonable postings on Facebook border on the very bullying which we are accused of. 1st September 2014 Steyning Parish Council wastes two years and tens of thousands of pounds. Here is the Council's press release abandoning the planning application and blaming it all on the village green registration which was completed back in February 2013. This is precisely what we advised the Parish Council about in an email sent to all the councillors and the Clerk as long ago as 29th August 2012, soon after the registration process started. They would not listen then and they would not listen in 2013 when SPC wrote to HDC saying we were wrong (letter on HDC website 7th February 2013). Finally, in 2014 HDC had to belatedly get the legal advice SPC should have got when it was first advised of the problem. And now we see the consequence. Will anyone on the Council have the humility to apologise and resign? Below, is what we said at that time about the village green when we urged them to review their decision to go ahead. Readers can also see the many stark warnings about the village green at the following postings on this site (below):- 21st August 2014, 19th August 2014, 15th August 2014, 26th June 2014, 22nd June 2014, 12th May 2014, 27th January 2014, 5th August 2013 (item 18 in linked document). There are also letters from us which anyone can see on the HDC planning website going right back. So there was no excuse for anyone to say that this outcome was a surprise. This was all ignored, with the consequence that so much time and money has been wasted by the Council over the following two years. SPC admits in the Herald that it has "spent £15,000". That appears to completely ignore the value of the time wasted on the project - time SPC was very keen to quantify at an hourly rate when it suited it to claim that answering questions on the project was taking too much of its time. We do not think this figure comes even close to the true financial cost of the project over the last two years, let alone the social cost. How much more is this going to cost us all as the Council seeks to show that the registration was “improper” – a registration the Council itself extended to the bulk of the MPF back in 1974? And why has SPC sat on its hands since the registration eighteen months ago if it though the registration was improper?
" As for the actual construction of the skatepark, we believe that this too will be or will become unlawful on successful registration of the extended Green. This will be unlawful both under s12 of the Inclosure Act which prohibits "any injury to the village green" and under s29 of the Commons Act which prohibits "any erection thereon or disturbance or interference with the occupation of the soil thereof which is made otherwise than with a view to the better enjoyment of such town or village green or recreation ground." 1 While there might be "better enjoyment" by the skateboarders themselves, there would not be better enjoyment by the rest of the inhabitants of the locality who use the Green, as they are going to suffer detriment both because of the actual area occupied by the construction and because of the noise it will generate, leading on balance to a decline in the enjoyment of the Green rather than to its betterment. 2 Because a village green has the special status of having its benefits conferred on the inhabitants of a particular locality, not on the public at large. Accordingly, unless you are able to restrict the use of the skatepark to the local residents and can exclude the general public (which seems to us to be impossible) then you will be creating better enjoyment for a portion of the general public to the detriment of the existing rights of the inhabitants over this area of the Green. We trust you will take this into account when you are considering how, and indeed whether, to continue to pursue the planning application". And they still will not listen now to our repeated warnings that the site is predicted to be too noisy and so noise nuisance legislation will close it down even if they manage to roll back the VG registration. Will they waste another two years at greater social and financial cost? Will history repeat itself? As one vociferous supporter of the skatepark writes to the press bemoaning what he see as “intemperate” language from us, the vitriolic and wildly inaccurate comment on the skatepark proponents’ Facebook page increasingly drags that site into disrepute. Surely few can now be taking the site seriously. Mr Ian Alexander, who we would expect better from as he is chairman of the Steyning and District Community Partnership, is/was a scout leader and is the spouse of a parish councillor, is one of the worst offenders in stirring up community conflict with his intemperate references to “bullying NIMBYS”, “gutless creeps”, "loonies" "losers", threats to kick us back into our hole, etc. etc. He simultaneously ramps up emotions among the skatepark supporters with false claims that the village green status which has existed at the cricket square for forty years means that the Cricket Club is at risk because children can skateboard on the artificial wicket area due to some unspecified actions of the Friends. We cannot be more clear. Neither the village green status which has existed since 1974, nor the recent extension of it to the Rublees end of the MPF, presents any threat to the Cricket Club and its pitch. We have set this all out in earlier postings but if any committee member of any club has any doubts about this we will be happy to discuss the matter directly. Too much damage is being done by this sort of misinformation generated by a handful of Facebook contributors. This misinformation appears to be a deliberate policy designed to whip up support for the parish council’s decision to attack the village green status of the MPF. Accuracy is apparently unimportant. 30th August 2014. And yet more scare-mongering nonsense. Mr Ian Alexander (spouse of Cllr Mariella Alexander) has put this on Facebook. How does he think the clubs have survived the last forty years since the MPF was registered as a village green by the parish council? "So if the MPF is a VG and the fact is it is for now the end of the Cricket, Tennis and Bowls clubs is a real possibility. The cricket club should not be allowed to fence their square preventing 24/7 access so that children can skate on the artificial strip and play any game they wish on all of the MPF VG. The Tennis and Bowls Clubs should not have a fence or locked gates allowing ball games, skating, bikeing (sic) on their courts / greens." Firstly, they all pre-date the village green extension registration and so are not affected by it .Secondly none of the clubs operates in the part of the VG registered by the Friends. They all operate on the 1974 village green and pre-date that, too. Surely Mr Alexander cannot seriously believe what he is writing? This is just more alarmist propaganda. "The land still belongs to the council in perpetuity for the community, but the FoMPF have effectively tied the council's hands on what can and can't be done on the playing field. The rest of the community, including the council, has no power to stop the repercussions stemming from what the FoMPF have done. The parish council will find it increasingly difficult to maintain and support the many clubs on the playing field. Village Green status will affect such things as vehicular access to and from the rear of properties surrounding the field for repairs. Even simple things like allowing a bouncy castle for a children's party, or even repairs and updating of existing sports club buildings will be problematic. The tarmac skatepark strip will remain an eyesore because the council will not be permitted to do anything about it." The vast majority of the MPF was registered as a village green in 1974 by the then Parish Council which wanted to preserve the unique qualities of the MPF for the benefit of all its residents. None of these alleged difficulties has been a problem since then. Why would anyone other than a propagandist dispensing scaremongering misinformation wish to suggest that a bouncy castle could be a problem, or that maintaining and updating the existing club structures could be a problem? There is no truth in this whatsoever. The only part of the MPF supposedly "improperly" registered by the Friends is up at the Rublees end - the very part the skatepark supporters say is not used by anyone including any of the clubs. The truth is that the small group which is so vociferous in pushing this ahead wants to remove the village green status precisely because its aims are incompatible with the long-term safeguarding of this asset for all Steyning's residents. They want to appropriate it to their own ends. This is what we said to WSCC when SPC unsuccessfully opposed the registration. While circumstances have changed the detail, the substance remains spot on. “……In any event, the successful registration of the area as a village green would be to preserve it as an open space for ever for healthy outdoor activities for all the inhabitants of Steyning which is what the Parish Council claims is its aim. 28th August 2014. MPF Skatepark Planning Application Dropped According to today's press reports the Parish Council has dropped the planning application because of the village green status of the MPF site. 22nd August 2014 Play equipment disrepair details. As there is still no sign of the mandatory annual play equipment report here (1) and here (2) and here (3) and here (4) and here (5) and here (6) and here (7) and here (8) and here (9) can be seen photos of the state of our play equipment assets caused by the over-stretched maintenance budget. Not to speak of all the other disrepair including the existing public lavatories and the pavilion. What will happen when we also have to pay 5%-10% of the capital cost of the skatepark in annual maintenance plus the cost of running the new toilets and the new CCTV? The following question should be answered at the next meeting of the Council. 1 The last annual play equipment inspection was carried out in May 2013. At the July meeting of the Playing Field committee it was stated that this year’s report had been commissioned and the PC were waiting for a date when this was to be carried out. Please can you advise the date of the inspection and if it has now been actioned, please can the report be put on the Council’s website? c) The Council’s policy with regard to a sinking fund for replacement and improvement of equipment. For example, Upper Beeding Parish Council have a ‘Replacement Funding Strategy’. Do Steyning Parish Council have something similar ? 21st August 2014 One of the main contributors to the supporters’ Facebook page suggests that we have a record of failure. “Their obsession means they cannot face failing (again) and they will try and win at any cost to the community be it social or financial. Being in the minority and wrong is not a problem for them. Half and twisted facts on there (sic) website are not a problem for them” says this proponent. Readers can make their own minds up about the accuracy of our site, supported by source material and compare it with the stuff that gets put on the Facebook site. Time and again we have had to put forward documented facts to counter the wildly inaccurate statements appearing there. Readers can also make up their own minds about who is driving up the social cost by comparing our site with the often abusive postings on the proponents' Facebook, by examining SPC's tactics which are not those one would expect from a body of integrity, and by examining the tactics adopted by some of the proponents who even deliberately corrupted the noise readings. Readers are also invited to make their own minds up about the financial cost as SPC carries on with a project it knows is predicted by two experts, including its own, to be too noisy and in breach of the Environmental Protection Act and which local residents have the resources to oppose. Substantial legal costs and damages are a real likelihood and it seems SPC has no insurance against this liability as it presses on in breach of its own public assurance that it would not think of proceeding if the skate park did not comply with the conventional noise criteria. Which it does not. It also knows that the skatepark is likely to be ruled as illegal under the village green legislation and so the substantial cost of reinstating the site will fall on the public. SPC has no budget to maintain the skatepark and meanwhile the play equipment we already own falls into terminal disrepair as SPC says it cannot afford to maintain it. And not forgetting the cost of applying for planning permission for a skatepark with bunding which could not be built, then hurriedly redesigning without it, then after realising it was in breach of its statutory duty to the disabled introducing an ill-considered car park and access track in breach of a different statutory duty, then changing the design yet again to do away with the disability facilities after finally accepting what was obvious to everyone else - that the access path was totally unsuitable for the disabled. Also not forgetting the cost of re-doing the corrupted noise readings. The cost of the new toilets for the facility and for maintaining/ cleaning/opening and closing them has not been dealt with at all – the existing toilets in the pavilion cannot be used as they are not open for sufficient hours and access is through the changing area with obvious safeguarding issues. The existing toilets in the car park and the Steyning Centre are meanwhile falling into disrepair apparently due to an insufficient maintenance budget being available (check out the loose taps, loose door locks, leaking urinals, uncleaned floors, unvarnished doors etc.). And of course the pavilion gutters have been leaking for something like two years. Any of the already overstretched budget diverted to the skatepark is going to make these issues even worse to the detriment of the whole community. However, let’s look at this proponent's definition of our “failure”. 1 HDC accepted our case that its original planning meeting was fatally flawed. Hence the need for a new planning committee meeting – more than two years later still ongoing, which is a pretty good indication of the unsuitability of the site. 2 We objected to the bunding which SPC was proposing without the faintest idea what it would look like. Our scaled illustrations led to the idea of bunding being dropped after a year of resistance from SPC when belatedly it accepted that our illustrations were accurate and the bunding would not be acceptable due to the topography it had not taken into account. 4 After two judicial reviews (put on hold to a later date, not unsuccessful as is claimed) regarding the rushed and flawed decision to include a vehicle access track and parking next to the skatepark, the idea was finally dropped with equal haste when SPC belatedly - and after wasting up to £20,000 in legal costs - accepted that we were right and the decision was indeed deeply flawed. 5 The JRs also brought about a fundamental change in SPC’s procedures as until then none of its committees had any terms of reference and none of the members had been properly appointed and so all their decisions had been unlawful. 6 The idea of tarmacking the footpath from Mill Road up to the allotments (in the original design and access statement) appears to have been dropped as a result of our objections. 7 We objected that the footpath from Mill Road was not suitable as the approved access route for anyone, let alone the disabled as SPC intended. That idea was finally dropped after two years of opposition from SPC when it finally accepted we were right. It had to be told this by the HDC disabilities officer. 8 The plan to have the existing toilets in the pavilion shared with the users of the skatepark appears to have been dropped (the planning documents remain equivocal on this) after we pointed out what should have been obvious safeguarding issues. 9 We achieved a recommendation for planning approval for the Leisure Centre site – then refused only because the planning committee was pre-determined and made its decision without a proper planning basis and because SPC objected for no good reason. If the MPF cannot go ahead, then SPC trying to spike this much more suitable site may be regretted. The appeal on that is pending. 10 We achieved the withdrawal of the recommendation for consent re the MPF. The outcome of that is still awaited as the planning application has been put back every month since April. Will it go ahead in September? We think that will depend on what SPC decided at its two recent meetings in private - and it will not tell the public what it decided to do even though it is a public body, building a public asset on a public village green and it is the public who will pick up the tab if it gets things wrong. And getting things right is not something SPC is noted for. Unfair criticism of volunteer councillors doing their best as the proponents claim? Let's not forget that we are paying for a professional parish clerk and her deputy whose job it is to advise the councillors. Also, that by definition as volunteers the councillors have offered to do the work and so must expect the criticism for things that go wrong as well as the praise when they go right and that being a volunteer does not justify isolating oneself from all except those who agree. That has been the root cause of many of the reversals coming only after time and money has been wasted. 11 We have the only website which supporters and opponents alike look to for reliable information about what is going on - with viewings now running to over 3,000 per month and increasing all the time. We have had another spike in viewing as the community tries to find out what SPC will not tell us - what it decided at its two meetings from which the press and the public were excluded. We think this is a pretty good record of success when all the establishment bodies have been against us. We remain very grateful for all the messages of support from local residents who think we are doing a vital job. 19th August 2014 260 Visitors to our site on Friday! (Second Posting) Prompted by the press articles about the Council's inappropriate secrecy about what this public body is intending to do about constructing a public asset on a public village green and to be maintained at public expense, the public is seeking from us the information it ought to be able to get from SPC's website. The SPC public site which has nothing useful at all to say on this or many other important matters. Unfortunately there is nothing we can add at the moment except to say that Steyning has forbidden WSCC to answer an FoI request regarding correspondence exchanged between these two bodies concerning the beneficiaries of the village green registration. We can only speculate that this is because WSCC has confirmed what we have been saying ever since the registration but SPC does not want the public to know this. Namely that the WSCC registration of the VG extension at the top end of the MPF was for the benefit of only the most local residents (despite us applying for all residents) and so the skatepark will be illegal as it is not for the "better enjoyment" of the green by those local residents who will be most affected by all the downsides of the facility. 19th August 2014 (First Posting) Cricket Club embarrassed by false information fed to it by MPF skatepark supporter. The Friends were subjected to severe unwarranted criticism as a result of untrue information being given to the Cricket Club from a so-far unnamed source who must also have the ear of the Wilson Memorial Trust (who are responsible for at least half of the funding for the skatepark). Although it came late in the day, the Club has now given the Friends a full and generous apology which we are very happy to accept. Our committee member who was suspended as a direct result of the dispute this engendered has also now been reinstated. We are very pleased that this is one division in the community resulting from the project and from mischievous misinformation from an MPF skatepark supporter which can now be put behind us. Here is the Club’s apology – of course it was not the minutes which were wrong but the information given to the Club by this yet-to-be-identified person. We should also emphasise in view of the word "official" in the apology that there was not an "unofficial" complaint from us either.